Okay! Musume Time: C-ute's 'Dai Nana Shou "Utsushikutte Gomen Ne" Album Review! C-ute's 'Dai Nana Shou "Utsushikutte Gomen Ne" Album Review! It has been a while since I last blogged, but I've become lazy - that, and the fact that literally nothing H!P related has happened kind of limits me to what I want to do on the blog, though I was aiming to do a 'Why I love these songs' post, or something along those lines... but then I found C-ute's latest album, and decided 'Heck, let's review it' - Be warned, most of this will be first impressions as opposed to me knowing what some songs sound like and knowing if I like them or not. Also, I'm feeling so freakin' tired right now, so if my writing is blaaah - you know why. 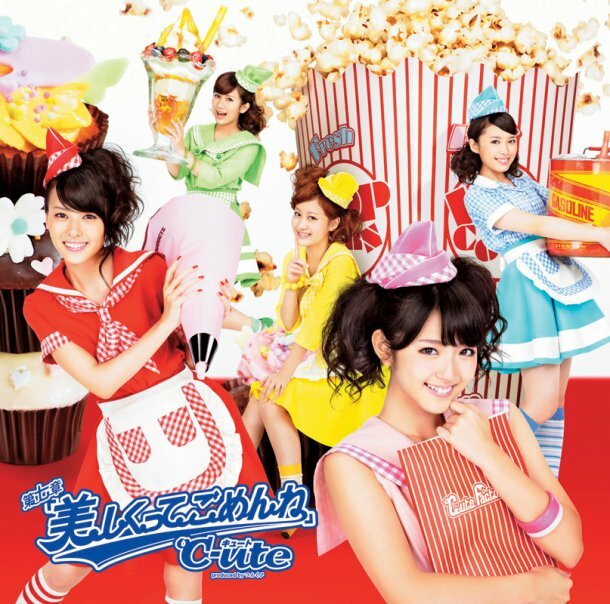 So, let's dive into C-ute's 7th album, titled Dai Nana Shou "Utsushikutter Gomen Ne"
I don't think that I ever actually reviewed this PV on here at all, though I actually mentioned it in a post on my Top 5 Summer Songs at the time, but honestly, I do like this song - granted, it isn't my favourite C-ute song of all time, but I do like it and I thought that it was a cute edition to the bundle of summer songs that were coming out at the time. All I can honestly say about this song is that it's a very cutesy, happy and sweet song that isn't overly hyped up or childish, but still gives that taste of summer. I liked the PV to this video too, especially the dance scenes. And yes, the setting was cheap - but C-ute made it work, and I enjoyed the randomness that was delivered in the video. Overall, this is a really cute song, and I kind of expected to see it in the album. This is my first time listening to the song, in all honesty, but straight away I really like the cool vibe that it has - it's a bit cooler than most other C-ute songs, and kind of reminds me of Tokkaiko Junjou for some reason - but I will say that is the matureness of the sound, rather than the song itself. Anyway, the vocals sound pretty good here - especially Airi. I would say the only problem really is Mai's voice. I know the girl is a good singer, but these sorts of songs do not suit her. I would have honestly preferred this song to have been all about Maimi, Airi and Chisato, because they suit these songs - if Nakky didn't cutesy it up (or the studio didn't do that, who knows?) and Mai didn't sing in it, the song would be really really cool, in my opinion. Yes, I like Nakky's and Mai's voices - but not for these sorts of songs. I honestly have a feeling that I won't listen to this song again, though - it doesn't really stand out that much, and though the vocals are good, the tune is forgettable and bland in comparison to other songs. Aaaaand, I have already forgotten the tune to the second song now that this one has come on. I recently reviewed the PV to this song, and I actually do like the song - the PV is just a bit bleh. Now, this is the sort of song that I like to hear Mai singing - it suits her voice, and she sounds happy in it. Honestly, it works for her and it really shows off her cuteness when she sings, and doesn't totally draw attention to how vastly different her vocals are when she's singing with the other members. It's this sort of song that I want her to continue singing, because it's just better for her. Do I like her vocals? Yeah, I do - Mai has a good voice, but her voice sounds pretty much amazing in most cutesy songs that work for her. She doesn't really suit cool, ballady type songs because she doesn't have a low voice. Or at least, that's what I think. The fourth song on the album is another one that pretty much everyone is familiar with, and honestly, one of my favourite songs. During the time when the PV came out for this song, something kinda happened, and this song was pretty much what saved me from falling deeper into depression, so for that, it is really special to me - it is also the first single from C-ute that I have purchased, because of how much I love it. I know that this isn't a very popular single with most fans, especially the PV, but really I do love this song a whole lot - in my PV review I expressed a great amount of happiness because of both the song and video. I was amazed by C-ute when they released this, and I still am - the song is so happy and lively, and it made Momoiro Sparkling pale in comparison. I want to smile when I hear this song, and Mai really shined in this PV, which made me love it a whole lot more. Honestly, the girls are amazing in it and everyone sounds great! I can't really say any more about the song other than that I absolutely adore it, and I don't think that that feeling will change any time soon. I don't think that I can express how much I really do dislike this song. I don't know why, but when I first listened to it, I never wanted to hear it again. The vocals are all right, but I think that it is the overall finish of the song and how it was made. Yes, it's a Marching song, but it's also really really annoying. Most of the singing parts are really... weird, at least for me, like when the girls elongate certain words like 'Ah'. I do like the March beat to a certain degree, though - I also like that Mai and Nakky had a pretty big portion of lines in this song, because unlike song numero 2, they fit this type of weird song, and sound good in it. Nakky especially, might I add. But, other than that... I hate this song and never want to listen to it again! Finally, Chissa's solo song - and, believe it or not, this isn't my favourite song. I know that Chisato is my C-ute bias, but really, I do have an opinion on what songs I do and don't like, and this is one of the songs that I am a little... meh on. In all honesty, I don't think that this song is memorable - but that's probably because it just doesn't really suit my taste buds. I like the song, but it isn't something I would want to listen to on a daily basis. I love Chisato, and I am freakin' happy that this was her song - if Nakky or Mai had gotten this song, then... I would have cried. Speaking of Nakky, here is her solo, and my favourite song on the whole album - this is one of the songs that I have listened to over and over again simply because I adore it. Nakky's song is happy, cute and extremely sweet. It suits her adorable voice to a T, and honestly? This is the song that should have had the PV, not Mai's. I don't know why I like this song so much - it's probably that peppy happiness that is in it, with the carefree tune and the random 'YEAH'S' and 'whoo's' added into the mix. I also like that the song isn't totally hyped up, but it has a good amount of energy to get everyone into a good mood. Added with Nakky's voice, it makes the song really nice to listen to. I may not be the biggest fan of Nakky, but I do adore her voice. It kind of annoys me that this song has the other members added to it, though - in random parts you can hear everyone else from C-ute, and it makes me wonder why only Nakky gets this treatment, and not Mai or Chisato - however, I guess the added vocals sounds really cool and it kind of reminds me of an 80's (or 60's) singer with a backing chorus that sang certain parts of the song, like random little lines that the singer couldn't sing herself. So, I guess it's a nice way to add in everyone else - but I would have loved a complete Nakky song. But it's nice to hear full on Nakky without Maimi or Airi or Chisato hogging the lines. Hey, another song I haven't heard of! And looking at the lyrics, it seems that it's a pretty fairly distributed single. Straight away, I can tell that this song is a a very slow and sweet-sounding ballad that kind of reminds me of, weirdly enough, new years and Sakura blossoms - don't ask me why, it just does. The song is very soothing to me, and extremely sweet. Nakky sounds absolutely gorgeous in this, with Chisato sounding quite nice and Airi sounding good too. The others? Meh. Honestly, this is the sort of song that suits Nakky so well other than a cutesy song - I know that she didn't suit the cool type song, but here she sounds absolutely wonderful. This song, I really wish that it had been made for her and not everyone else now. Okay, Chisato just sounded gorgeous on her last solo! And Airi just... breath taking! Enough said, this song is amazing! Bring on the next one! What the hell is this pile of crap doing in this album? GTFO! The final song on C-ute's 7th album, and it's another ballad - a nice way to finish an album, in my opinion. There is a distinct male voice in the background of this song, which, whilst a bit weird, suits the tone of the song and helps the voices of C-ute to stand out. The girls sound really good, especially as they are all singing together, and the song reminds me of graduations, goodbyes and well-wishes - a perfect song to end an album, in my opinion, because of the overall tone of the song - and, looking at a (bad) translation of the lyrics, the message seems extremely positive and hopeful - More so, the song is about looking to the future and not looking back, and that you shouldn't be ashamed of mistakes, and to protect those that you love. The song is, basically, very nice with a good feeling to it - even if it is a sad melody, it still makes me happy and hopeful, and is very refreshing in its own way. I like songs that are slow to end albums - and as C-ute's opening track was an energetic one, it's a great way to finish off a pretty solid album with something soothing and gentle, something to end the album peacefully. So, overall, this is a pretty decent album - there are, of course, songs that I think lack and songs that I don't like, but I'm pretty sure that is what is in every album. I think that, in all honesty, the Berikyuu single shouldn't have been put in there, only because I really don't like the song and because I feel that C-ute should have their songs on there, and not a shared one - however, it makes me feel better that Berryz get the sucky song on their 8th album, too, so meh. Anyway, as I said - there are some hits and misses for me, but I bet a few people will disagree with what I like and what I dislike, but it's all about personal preferences - I seem to like the happier, cuter songs or more soothing and ballad-like ones as opposed to cooler songs or... freakin' marches. Anyway, I hope this was... interesting. I apologise for not updating lately, and for just bringing out a really bad post to get me back into swing. But hey, these are my honest thoughts. Have you guys listened to the album yet? If so, what songs are your favourite, and what are your least favourite? Personally, I LOVED Zuntaka March. Oh my god, I heard it as a radio preview on Youtube which then got pulled down and I went mad trying to find it again because I loved it so much and couldn't wait until the album came out to hear it again! Heh, isn't it weird how different people are? My second-favorite song was probably Kagayake! Houkago too, though.